Lovers, the dashing Prince William may have officially been taken off the market last week by none other than le charming fair maiden known as Kate Middleton, but that is no reason for you to sweep your dreams of becoming a princess out the door like the wayward cobwebs caught by the bristles of Cinderella’s broom. Darlings, if we have learned anything from the fairytale characters we cherished as children, it is that anyone can be a princess as long as one is in possession of the l'un numéroter item that signifies your stately presence – the headwear. More specifically, tiaras by David’s Bridal. Non, there is no need to worry, mes chéris. Whether you’re in the midst of planning your foray down the aisle with your very own Prince Charming, or still searching high and low for the cute boy who will sweep you off your feet and flourish you away to a castle in the sky atop the back of a strapping white steed, there is no question about it, a tiara is not a maybe, not a might, but an absolute must for the Princess-In-Training’s accessory drawer. From the Tall Princess Crystal Tiara to the Rhodium Tiara with Round Stones or Floral Vine Tiara with Pearls and Rhinestones, a tiara is a fabuleux way to prepare a glamourai like vous for a life of extravagance. But beware, my loves; as Paulo Coelho once said, “In fairy tales, the princesses kiss the frogs, and the frogs become princes. In real life, the princesses kiss princes, and the princes turn into frogs.” Regardless of the outcome you encounter, however, one thing you will know for sure is that you will forever be in possession of a pretty that makes you feel like a true princess – after all, one could expect nothing less from a tiara! Thanks to David's Bridal for the picture. I like the simple elegance of this tiara. Very chic. It was a beautiful wedding last week, lots of stunning fashion going on in London. Wow, I've never thought of something like this. How cool..brides? wear them? Very pretty... I wore a tiara for my wedding. I totally want to wear a tiara at my wedding... it'll be the only time I can get away feeling like an actual princess! the wedding was absolutely amazing and i loved the tiara so simple but still made a statement. loved it!! I am such a fan of tiaras, but I don't want to wear one. I don't know why that is, but it is. Strange, isn't it? Ive always adored tiaras and am so glad they're making a bit of a comeback with the royal wedding madness in full gear. Yes please! 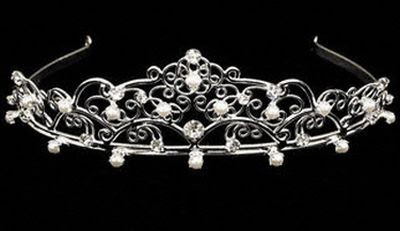 I want a tiara so badly! I don't think it would go with my wedding dress. But hey, why can't I wear one every day? That tiara is amazing. I would love to wear one for my wedding (whenever that may be). What a sweet post...and that quote is hilarious! When I got engaged I went in with Husband to have the ring sized... and spotted the most amazing emeral and diamond tiara. I instantly attempted to trade the ring in for an "engagment tiara." Husband asked where would I wear the thing... my response, EVERYWHERE! I didn't get to trade but he suprised me with the tiara at our rehersal dinner. and I do wear it every chance I get! how about if i just want to wear it for daily living? not exactly sure how that would go over at work however. I wore a beautiful one for my wedding, it looked a bit like the one in the picture actually. I am thinking about having a section for them on my Costume Jewellery site. I'm getting married soon, this post is very useful, thank you.